Most likely you’ve seen an auto-wrap on a core spun yarn, but did you know you can auto-wrap onto a standard single. As you spin the wool you can allow a strand to auto-wrap finishing your single. A yarn that has been spun with an auto-wrap cannot be plied! (The only exception is if your wrap is thread- sewing thread generally doesn’t have a twist that effects balance. Or try any way you might get an effect that you love!) Think of it this way, you have a second or third stand created with the number of auto-wraps you added. Auto-wrap creates an irregular affect, the wrap has a different twist angle than the underlying single you’ll spin up. First take a look at your wheel, what does you’re orifice look like? Is it flush with the front of the wheel? Or does it have a delta, ring, or orifice that extends past the maiden head? If your orifice is not flush, or you have a delta or ring you need to hold your hands so that one of your front drafting hands fingers works as a guide for the auto-wrap. Your hold on the auto-wrap keeps the wrap from being tangled on or into your orifice. If it is flush you can just let the auto-wrap strand drop and hang down. To start spinning this technique requires you use a short draw method of spinning. 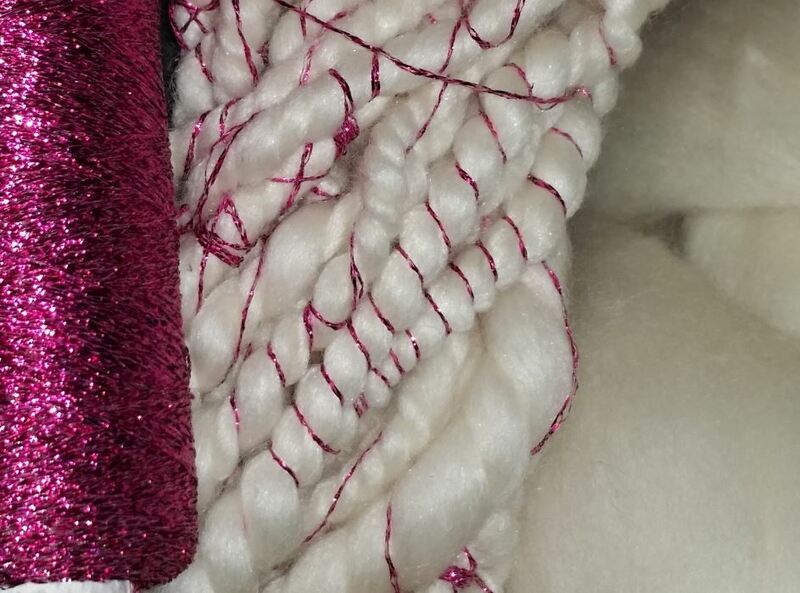 If you use a long or modified long draw, or allow the single to get too long from the orifice there will be long sections that do not accumulate as much twist, so the auto-wrap is beside the yarn not wrapped around it. Start Spinning! Get a start on the leader then stop, now you’re going to want to tie in your wrap. You want the least amount of tension on the wrap, so set your wrap supply at your feet in manner that the only tension on it is what you could (but shouldn’t) with your hand. If you’re an even spinner the wrap will be fairly consistent, but you can play with how fast or slow or often you allow the yarn to enter the orifice. That’s all there is to it. This is Really easy to over twist: don’t try to fix by spinning it back the other direction, because you have two stands with different twist this will not add any balance. You can wrap with anything you want from metallic thread to a Commercial mohair blend to create a delicate halo effect, or a hand spun single. If you’re auto-wrapping with a handspun single know which directions you spun it. If your single was spun S, clockwise (wheel turning clockwise), then your spinning that the single will wrap to needs to be spun Z counterclockwise (wheel turning counterclockwise). If you spin both the same direction your single will be massively over- spun, and will not attach to the spinning. Next articleIt’s that time of year again!! SUPERBOWL TIME OF YEAR!